Small, medium and micro enterprises (SMMEs) are the backbone of economy. With an increased focus from government in driving support for emerging SMMEs, there are big opportunities for emerging businesspeople to apply their entrepreneurial ability in the construction, earthmoving and related industries. If your business falls into this category, you need to keep three key factors in mind though: your plant and equipment (the ‘yellow metal’) is expensive; your business depends on the availability and reliability of the machinery; and all your plant and machinery equipment operate in inherently dangerous places and unpredictable circumstances. It is therefore critical that good business insurance cover is in place all the time (even when – especially when – cash flow is tight). Not doing risk management. Consider the risk of one of your yellow metals bulldozing its way into a water main, a truck slipping sideways into a quarry – or just the damage to an expensive tyre caused by stones in the road. Look out for the things that might negatively impact operations, and take action to make sure those risks are understood and a plan is in place to deal with any problems that arise. Not having the right business insurance in place. Often, the insurance solutions offered are targeted at big commercial operators, not SMMEs. The pricing and the scope just isn’t appropriate. Find a company that understands your business, the risks you face and the equipment with which you work- , meets your insurance needs and suits your budget. Not considering the size of your fleet. 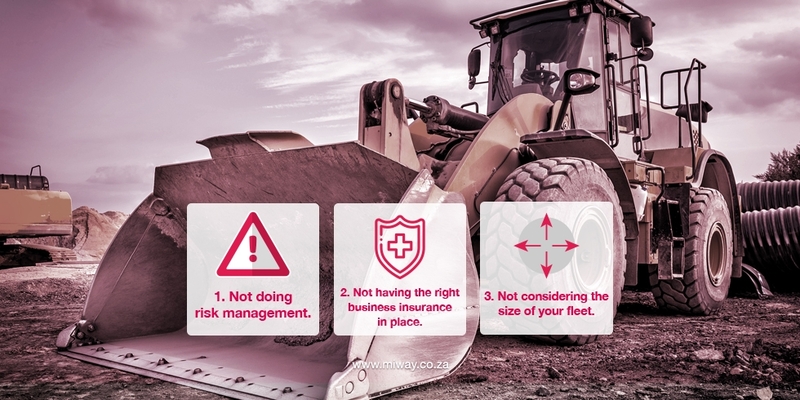 If you have a business with between 5 and 20 vehicles or pieces of equipment, look for an insurer with a specific focus on small and upcoming companies – with a developed range of products that can be tailored to suit individual customers and your unique set of risks. Your insurer should cover everything from cars and bakkies, to medium-sized trucks, and also heavy-duty trucks and yellow metal equipment. Research shows that between 70 and 80 percent of small businesses fail within their first five years. Beat the statistics by ensuring your insurer has your business’s back. MiWay is happy to help you find the right business insurance cover for your business!